This Weekly Special at Play-Asia.com is a steal. 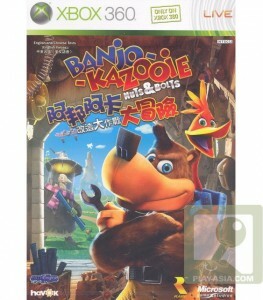 You can get Banjo-Kazooie: Nuts & Bolts for only US$11.90. The bad thing is that the game will only work on a Japanese Xbox 360. But if you do have it, get the game, it’s great. Famed game developer Rare Ltd. is reviving one of its most beloved and successful franchises exclusively on Xbox 360® with the third installment of the Banjo-Kazooie series. Banjo-Kazooie®: Nuts & Bolts® embraces new and old fans alike, as the famous bear and bird duo return in stunning high definition for an unique adventure of epic proportions. The Lord of the Games (aka LOG) is tired of the petty squabbling between Banjo and the evil witch Gruntilda (aka Grunty) over the years, and has arranged a showdown to decide the rightful owner of Spiral Mountain. Claiming to have created every video game ever made, LOG has built the game worlds in which the contest’s challenges take place. Banjo must complete LOG’s challenges to win, while Grunty tries to stop him using every method her devious mind can muster. Throughout your adventure, create your own abilities by building vehicles for Banjo to pilot over land, water, and air. Vehicle parts, which range from simple devices such as engines and wheels to more unusual equipment such as springs and egg guns, are earned and collected throughout the game. Use your imagination to combine parts in any order to create whatever vehicle you choose. LOG’s challenges have one goal, but your choice of vehicle and tactics will determine how you get there. By exploring worlds and solving puzzles, you will be rewarded with more advanced and diverse vehicle parts in your quest to defeat Grunty once and for all. With the power of Xbox 360® and Xbox LIVE®, Banjo-Kazooie: Nuts & Bolts brings an entirely new experience to the console and takes the franchise to a whole new level of enjoyment. High-definition graphics, user-created content, and online gameplay are just three of the many advances people of all ages and skill levels will discover as they embark on their adventure.